Solon Ohio Homes for Sale – Listed by Money as one of the “Best Places to Live” for three years, Solon, OH is hard to beat for those looking for a new place to call home. Solon is a suburb of Cleveland, which means residents interested in Solon Ohio homes for sale get the benefit of space and privacy along with the perks of being close to the city. 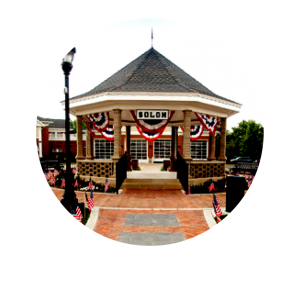 Originally a farming area, Solon grew over the century to become the beautiful community it is today. Because of its closeness to Cleveland, Solon was lucky to have a railroad station through town early on, which lead to its rapid expansion. The accessibility of travel continues today, and residents looking to find easy ways of visiting the city, or heading out for a weekend away will find a great deal of options open to them. Even if building a family isn’t on your radar, Solon has lots to offer. This includes a bustling town center filled with a variety of businesses and entertainment options for every occasion. Face to face business isn’t the only thing Solon excels in: in 2013 and 2014, Google awarded Solon with a eCity Award to recognize the city for having the strongest online business community in Ohio. Solon also has 687 acres of parks and recreational area, as well as 360 acres of Cleveland MetroParks. If golfing is something you look forward to, you’ll find three golf courses within the Solon borders. Readers will love visiting the library and choosing from its abundance of shelves, while art lovers will head straight for the Center for the Arts, located in the historic Old City Hall. Here you’ll find art, music, dance and theater classes, as well as a special senior program for those over the age of 55. If you’re ready to begin your search for Solon Ohio homes for sale, then you’re already on the right track. There’s no end to the greatness you’ll find in this beautiful and vibrant city. It has history, art, entertainment—Solon is so much more than just a home. Search below for Solon Ohio Homes for Sale. Contact our Sales Team for more information on Solon Ohio Homes for sale.